It is now generally agreed upon by most people that Ziaul Haq’s martial law changed Pakistan’s destiny for the worst. Most, but not all. A friend’s mother cried when Zia died because he prayed five times a day and was from the Arain clan, like her. In Saba Imtiaz’s 2014 novel, Karachi, You’re Killing Me!, her protagonist quips: “If there is ever anything you can count on at Pakistani cultural events, it’s that Zia – dead for longer than most people can remember – can still be blamed for everything.” I share her scepticism. I don’t believe in the Great Man Theory of history. I don’t believe individuals can single-handedly reshape the fate of millions. I believe great upheavals are caused by institutional and structural pressures and individuals only respond within a limited number of rationalised choices. Zia’s greatest legacy is said to be Islamisation but it had already taken root with the passage of the Objectives Resolution in 1949. 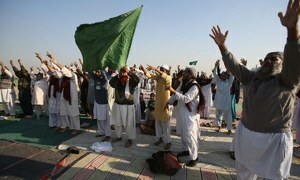 The Council of Islamic Ideology, too, had been set up in 1962 by Ayub Khan. Zulfikar Ali Bhutto’s economic socialism had very clear Islamic overtones. His efforts to unite Muslim countries were his major foreign policy initiatives. It was his 1973 Constitution that made Islamic Studies compulsory in schools. In 1974, Ahmadis were declared non-Muslims. In 1977, a federal law prohibited the sale of alcohol to Muslims. Even our nuclear programme was deemed to be making an Islamic bomb. The anti-Bhutto movement of 1977, too, used the demand for Nizam-e-Mustafa (the system of the Prophet of Islam) to replace Bhutto’s social democracy. All that was before Zia came along. This historical determinism, however, does not absolve him of his tyranny and the havoc he wreaked on the Constitution, democracy and political parties. Things could have been different with another tyrant. 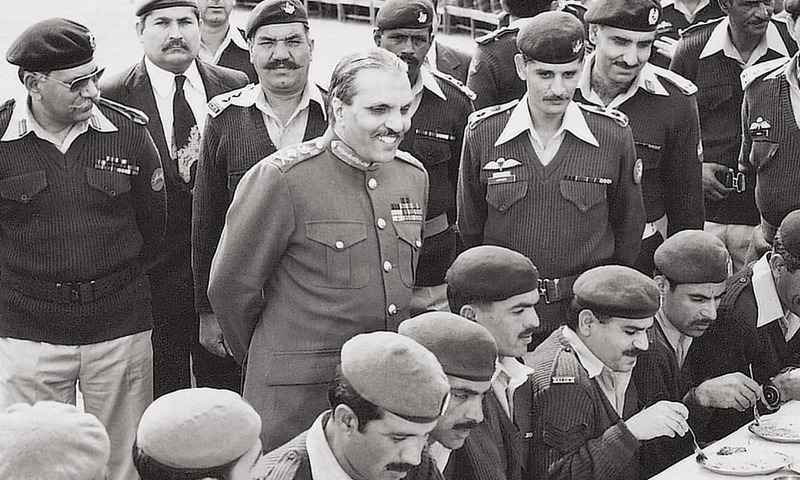 To start with, there was nothing certain about Zia’s rise to the top. Bhutto bypassed seven senior lieutenant generals to make him army chief because he was deemed to be the most disinterested in politics. But as we now know, the army acts as an institution regardless of the individual heading it. Consider the circumstances: the United States was not happy with Bhutto over the nuclear programme; the landed and industrial elite were not happy with Bhutto over land reforms and nationalisation; the army was not happy with Bhutto as per declassified American documents. All this encouraged Zia to carry out his premeditated coup d’état that turned into a coup de grâce for democracy in Pakistan. It is no secret that Zia lent heavily on Islam and ulema due to lack of popular support. Some of his concessions to ulema still haunt us to this day. The penal code was amended to add the death penalty as a punishment for blasphemy and increase the scope of what constitutes blasphemy. In 1979, he promulgated the Hudood Ordinances with punishments such as lashes for adultery. In 1980, he set up the Federal Shariat Court to hear appeals in cases under the Hudood Ordinances. In 1981, he set up a hand-picked consultative body, Majlis-e-Shoora, to act as the federal parliament. It was packed with ulema nominated by him. He also introduced mandatory zakat deduction from bank accounts, leading Shias to rise in violent protests. By 1984, he was feeling so confident about the strength of his constituents – comprising ulema, spiritual leaders, business community and the military – that he decided to hold a referendum that asked if people wanted Islamic laws in the country and if their answer was to be yes then that automatically meant that they wanted Zia as the president of Pakistan for the next five years. Nobody came out to vote. “Marhoomeen shareek huay, sachchai ka chehlum tha (The dead participated, it was the 40th day of mourning for the death of truth),” Jalib said of the level of public participation in it. In 1985, Zia brought in an elected Majlis-e-Shoora instead. The elections were held on non-party basis after a government-appointed commission declared that political parties were un-Islamic. The members of Majlis-e-Shoora were chosen presumably on the grounds of an election candidate being sadiq (truthful) and ameen (honest). These requirements were brought in as additions to articles 62 and 63 in the Constitution. The most well-known politician to come out of that exercise, Nawaz Sharif, was disqualified more than three decades later due to his failure to fulfil them. Another gift of Zia’s era was the radicalisation of Islamabad’s Lal Masjid. Its prayer leader, Muhammad Abdullah, was close to the general before he became close to the Afghan Taliban’s chief Mullah Omar and senior al-Qaeda leaders. It took another military dictator two decades later to uproot the extremist influence from Lal Masjid in a bloody operation in 2007. In hindsight, though, Islamisation seems more like political expediency than a well-thought-out system. His personal beliefs did not stop him from taking part in the Black September killings of Palestinians in Jordan where he was posted as a brigadier from 1967 to 1970. When he wanted Bhutto framed for murder he asked Mian Tufail Mohammad, then head of Jamaat-e-Islami (JI), to provide him with four people willing to testify that Bhutto paid them to kill a dissident politician. He promised Tufail, by one account swearing on the Quran, that these witnesses would be pardoned after Bhutto was hanged. They were hanged immediately after Zia had gotten rid of Bhutto. That is when JI distanced itself from him. He once had his picture taken as he bicycled to his office from his home, demonstrating an austere and protocol-free way of life. What the press did not show the public (and it could not because of the draconian censorship rules it was subjected to) was that hundreds of security personnel had secured the route before Zia started pedalling his bicycle. He introduced laws to socially and politically ostracise Ahmadis but then went on to give an official award to Professor Abdus Salam, an Ahmadi of Pakistani origin who had won the Nobel Prize in Physics. Beyond his religious hypocrisy, his actual enduring legacy is his systematic decimation of parliamentary democracy. 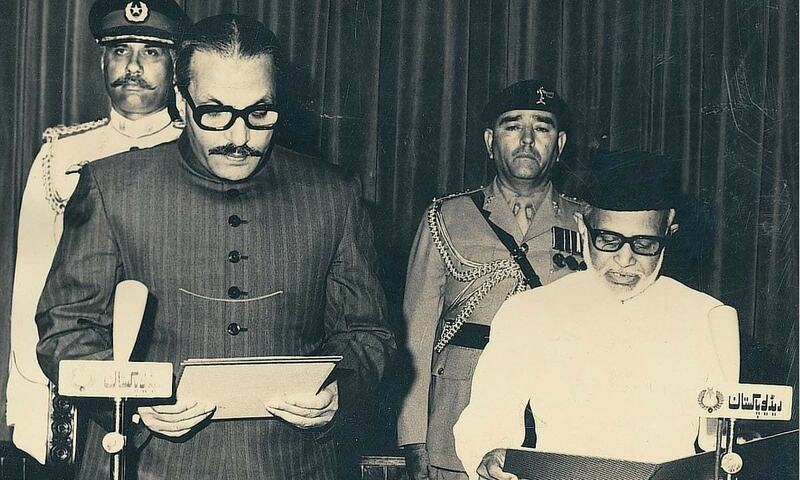 He introduced the Eighth Amendment to the Constitution of Pakistan in 1985 to protect his martial law from judicial review and acquire the power to sack an elected government and legislature on a whim — a power he exercised to dismiss the government of prime minister Muhammed Khan Junejo in 1988. The same amendment was subsequently used three times in the 1990s to remove democratic governments midway through their tenures. Zia’s crackdown on political dissidents and journalists resulted in the arrest of thousands of people. Many of them were incarcerated and tortured in the basements of Lahore Fort because the jails were all spilling over. Public floggings of criminals and political opponents were a routine affair and hangings were often projected widely in the media to scare people into submission. Zia also banned student unions in 1984, much to the impoverishment of youth engagement with politics in general and political challenge against fascist forms of conservatism in particular. The effects of this repression were felt throughout the next two decades as political engagement among the urban, educated middle and upper-middle classes started going down and violent groups organised on non-political grounds of religion, sect and linguistic prejudice assumed massive firepower to deadly consequences. Guns and drugs proliferated in his era. It was the age of Kalashnikovs and heroin. Automatic weapons, originally meant for Afghan mujahideen, were either smuggled into Pakistan or their replicas were produced in factories in tribal areas. Drugs produced in the border regions of Afghanistan and Pakistan were a major source of funding for the anti-Soviet warriors in Afghanistan. Illegal manufacturing and smuggling of both guns and drugs continue to this day in Pakistan. Then there were around five million Afghan refugees, many of whom came to settle here permanently. But, then again, the British-era Durand Line that separates the two countries can be blamed for all these problems as much as Zia. Is he responsible for every ill that plagues Pakistan today? I remain sceptical though I must admit that I did not have to live through his dictatorship. The writer and journalist graduated from the Lahore University of Management Sciences with a degree in economics. 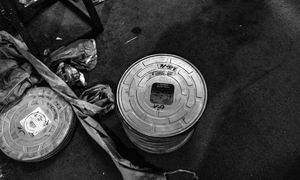 What has been the most absurd ban in Pakistani cinema? An unbiased, realistic, fair and true commentary. Why did you vote for secular parties who did mega corruption in Pakistan which eventually increased poverty, radiclization, sent us into a debt trap and a future water disaster? good write but nothing new. Same goes good for Mush as well. bad article, always blame zia. Zias biggest mistake was nawaz the person the same anti zia liberals support. A very good write.However decision at a certain time have to be weighed in keeping in view the geo political positions . "The man to answer for a lot that went wrong with Pakistan" He cannot now for his Plane exploded and fell from the sky and immediately brought back the memory of Mr.Zulfikar Ali Bhutto. So... the huge gathering at his funeral were there to ask the same? What about other Generals ? @Nusrat - President Musharraf tried to neutralize the negative effects of Zia era policies so your statement is totally wrong and I can smell a bias/discrimination against President Musharraf. @Shah Unfortunately there is never such a thing known as Election. It is always Selection. If it was a fair then we would've had seen some difference somewhere, sometime. But faces change, system and policies stay the same. @Shah Mr. do you know how much loan Zia took from IMF and World Bank? Zia was, is and shall always remain a nightmare. So you have excuse for everything, it was Amrika, it was Zia, It was India, what about you? Did you come out anytime to fight for the rights of the Ahmedi, Christians or the Shia? The only time you think about injustice is when it happens to you. The place where Pakistan came from and where it is headed, a Zia had to happen and Pakistan fully deserved him. What about now, the first act of the new government was to surrender to the obscurantists in the Atif Mian appointment though Imran Khan had the the support of everybody and his brother. @Nusrat :Correct. Both of them did whatever was necessary to fill their pockets and the pockets of their cronies. How about Bhutto ? He didn't have to answer why he agreed and helped to break united Pakistan ? why he said to Mujeeb-ur-Rehman "Uther Tum Ither Hum ?" why he tore down Poland's resolution in UNO to stop the war in East Pakistan ? why he said "We will break the legs of anyone going to Dhaka to attend National Assembly's session ? ", Because Bhutto realized that he would never be able to become the Prime Minister of United Pakistan since Bengalis would always be in Majority so he agreed to break Pakistan into two pieces and that way he became The Prime Minister of a broken Pakistan. He surely misused religion to hoodwink the masses! Many small men have and are still continuing to use religion as a political tool for strengthening their power, thus weakening the state and destroying the society. Jinnah anticipated it and therefore pleaded for a secular state constitution. Well, let us brush the Bhutto, Zardari and the Nawaz years under the carpet. I was no fan of General Zia, but to be fair, the troika of Bhutto-Zardari-Nawaz have done a lot more damage to the social, political and economic fabric of the country. What a great idea in a Democratic Country he gave Shariat Law. There is some thing good...once you die, you are done. I hope he was the last one of his kind. I am not surprised to read an article like this. There are people who would agree and some would disagree with what is written. It all boils down to blaming one man for the issues and forgetting what the democratic leaders did in the future. Zia had some flaws like most people but it was nothing compared to bhuttos and sharifs. what about bhutto and corrupt looters zardari and nawaz ,which brought the economy down and made every pakistani indebted . Bhutto divided the country for his lust of power . Most corrupt leaders were anti nationals and brought into power in a filmsy way . Family democracy plz highlight these issues too. Before you discuss Zia; you should have discussed the role Bhutto/Yahya played from break up of Pakistan to socialism and division in the country. Yes and No. If you look at the Pakistani society, deep down honestly, how many people will follow the law? Give you one example; people will and have removed the hooks and door knobs and seat foam from trains in Pakistan and that speaks of mindset. A farmer will steel water of his neighbour who is downstream and that has nothing to do with the institutionalization. At the time of Pakistan creation, many people used false documents to get property of others and so on. There is a need to change the narrative and peoples mindset. Zia, the man to thank for what went right in Pakistan. I was born after Zia died but I'm unable to understand if his 11 years had done so much damage why not to blame other rulers who failed to undo predecessors fatal mistakes ? I think Zia is made escape goat. All rulers damaged more or less. The distinguished writer deserves applause for his critical and facts based article. Congratulations to him and to the Dawn too. I completely disagree. He may have made some mistakes but how he handled the situation back then was nothing short of brilliant. The so called scholars should tell us how they would have handled the situation where a superpower was threatening an invasion to get access to warm waters through Pakistan. The strategic depth achieved back then is the only reason foreign forces working in Afghanistan today are unable to fulfill their objectives. But we are a people who do not think. The problem is not Zia, Secularism, Islamism, Imranism, Sharifism, Bhuttoism. The Problem are Pakistanis. They are the constant factor inbetween all these 'isms'. @Shah Because leaders of religious parties could not establish their trust. Shame on them! What about president Ayub khan, yahya khan & pervaiz musharaf . Zia would have solved many issues after beating the Soviet Union, RIP.